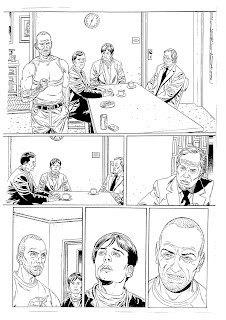 ..and this is the first page of John McCrea's story. Pigeons with lasers shooting out of their eyes! I think its a first. As well the cover Genn is doing a ten page story call "House Wins." This is the first page. I've alway loved Glenn's black and white artwork. Especially his faces, they alway seem incredibly real. This is the cover Glenn Fabry did for me last year. 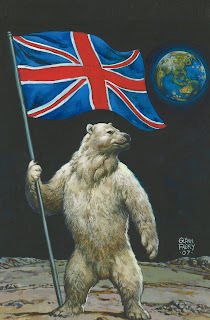 The image of the polar Bear on the moon relates to a script John McCrea has done for me called "Animal Kindom". 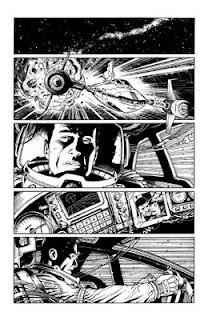 I am very pleased to show you a page from Dylan Teague which i think is fantastic. 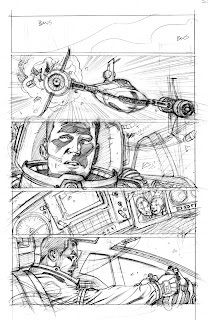 The finshed page and the pencilled version. This is the first page of ten from the script called Death Be Praised! Personally I think it looks fantastic and the rest should look equally amzaing. Still going and still serious. This may seem a little pointless, but a post seemed like a good idea. I'm still very serious about the whole project. I'll put some artwork on here very soon. The fact is I'm in that vaguely frustrating position that is inevitable. waiting for artwork. Glenn is working hard on the script I gave him which I can't wait to see the finished results of. He's a busy man and quite rightly in demand so I'm not expecting the pages overnight or anything like that, I just can't wait to see them because I'm absolutlely certain they'll be beyond fabulous. My only real news is that I have commissioned another artist. Don't know if I should mention his name at this stage, but a couple of clues can't hurt. 1. 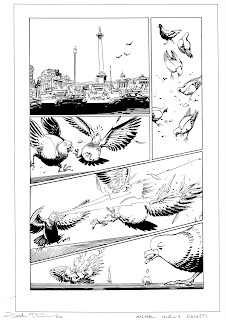 He's worked with Garth Ennis. 2. He's embraced all the new technology at an artist's disposle and is largely digital now. He's doing a ten page script for me in February and I'm very excited about it.